The news was announced that the technology multinational GMV, provider of system integration, development and engineering, has won a bumper contract with the European Space Agency (ESA) for maintenance, development and upgrading of Galileo’s Ground Control Segment (GCS). Galileo, the famous flagship of the European Union’s now flourishing space business, is Europe’s own global navigation satellite system. 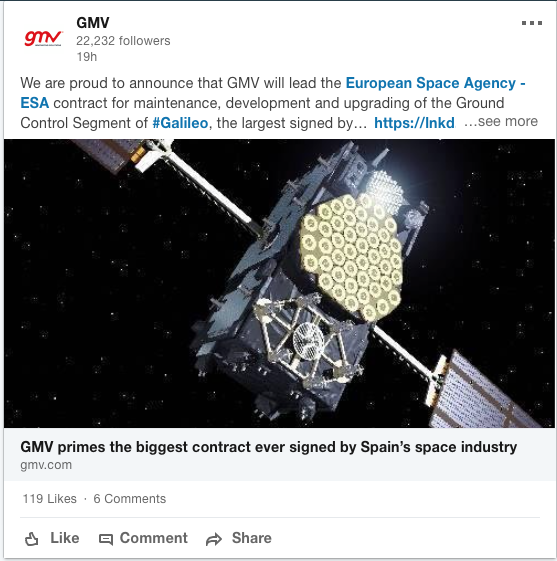 GMV’s framework contract with ESA is worth a total sum of 250 million euro, already including a signed-and-sealed contract for the first Work Order, in itself worth around 150 million euro. This establishes the venture as the biggest contract ever signed by GMV in its entire history. Additionally, the agreement is the biggest contract ever signed by Spain’s space industry as a whole. All this represents a huge boost for the company while also posing a great challenge that places GMV and Spain in a highly visible position. GMV is leading an industrial team made up by several European firms, with Group GMV as the most prominent as well as Spanish industry. Approximately 60 percent of the work will be carried out by Spanish firms; in all, the project will give employment to about 200 people, over 100 of them from GMV. The Ground Control Segment is responsible for monitoring all constellation satellites and includes all the necessary components for this purpose: the control center, the orbital dynamics system, mission planning, operational support, simulation tools, the key management facility, network security, the telemetry, tracking and command (TT&C) stations and the interconnection between all these components. The GCS comprises the main operations center, located in Munich (Germany) and Fucino (Italy), as well as the various monitoring stations spread throughout the world. As well as taking on critical GCS items, GMV, as part of its overall responsibility for the whole ensemble, will also attend to management of all the abovementioned functions, in all the sites identified, in liaison with the European Space Agency (ESA), as an end client. Its main remit is maintenance of all the already deployed systems, assuring operations already underway and organizing the future upgrading of the whole system. The cybersecurity aspects, led and developed by GMV, weigh especially heavily in the overall deal. This is the result of an essential part of the system to be maintained and upgraded, after all, calls for management of secure access to information of the Galileo constellation and management also of regulation-signal and high-performance access security keys. The GCS contains all necessary components for these management tasks, and the ultimate responsibility for the proper functioning of these components falls to the project. In the words of GMV’s CEO, Jesús B. Serrano who said that this is an unprecedented contract for GMV, won by fighting off fierce competition from the top space companies and reflecting GMV’s growing leadership. This contract award likewise represents a huge responsibility, which the company takes on with all the confidence of a team of exceptional professionals. This milestone will enable them to chalk up a workforce of over 2,000 engineers by 2019, making GMV Europe’s biggest medium-sized space company. From its inception GMV has grown as a firm across all its areas, but especially so in the space and cybersecurity sectors, as proven by them winning more contracts year after year and increasing its turnover. Now after a 34-year history, the company’s ongoing development has always been driven by ESA’s programs, managed by the Industrial Technology Development Center (Centro para el Desarrollo Tecnológico Industrial: CDTI) dependent on the Spanish Ministry of Science Innovation and Universities (Ministerio de Ciencia, Innovación y Universidades). Likewise, the European Union’s Galileo program, represented in the European Commission and its agencies by the Ministry of Public Works (Ministerio de Fomento), has always been another crucial growth factor for GMV. In the last five years GMV’s staff, currently 1800-strong, has grown by 44 percent. Its worldwide leadership in satellite ground control systems is further cemented by this contract, that shores up its position as a worldwide benchmark in satellite navigation and cybersecurity.